Galician Minister of Culture, Education and University Planning, Román Rodríguez, and the CEO of ‘Carpintería Ramón García’, Manuel García Gómez, have just signed a collaboration agreement to launch a new ‘FP Dual’ project at the ‘CIFP Politécnico de Santiago’. Specifically, this initiative will begin next year (2018/19) until 2019/20. It is necessary to emphasize that thanks to this formative modality students alternate their training at their education center with practices at the company. Students stay at the education center during the first two quarters of each year, while the stay in the company will extend throughout part of the second and third quarters. 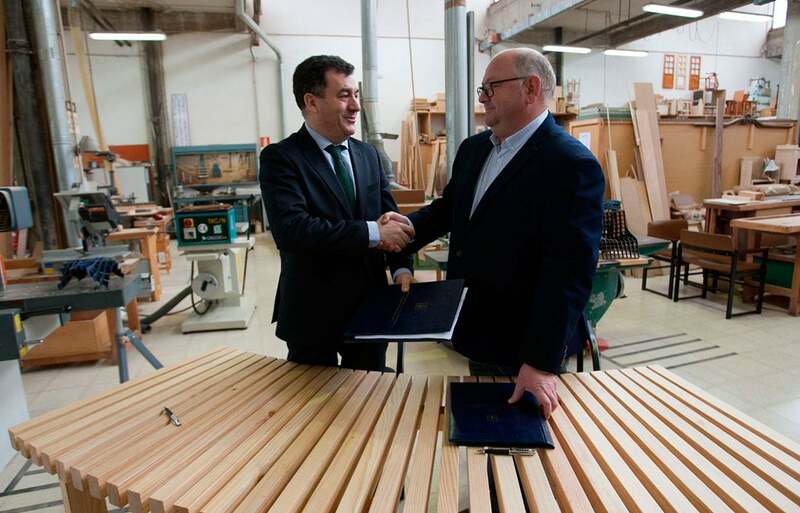 The joinery company will host a minimum of 16 students in its facilities and will collaborate in their selection, being able to carry out psycho-professional interviews and knowledge tests that allow identifying the suitability of the candidates in relation to the professional profile they will acquire in the company throughout their training period. Carpintería Ramón García also undertakes to finance the project through a scholarship system, with a minimum amount of 600 euros / month during the training and professionalization activity. Moreover, Carpintería Ramón García also undertakes to finance the project through a scholarship system, with a minimum amount of 600 euros / month during the months in which the training and professionalization activity is carried out entirely in it. In addition, students will be included in Social Security and will have a minimum of 30 calendar days of vacation per year.